We are learning to make inferences about a text in order to improve our reading comprehension. - Identify and explain information that is not directly stated. - Draw conclusions and make generalisations. Today in reading we read the inferring cards from the Into the Book Website. We had to infer what was happening from the clues in the text. It is important to identify key words that give the readers clues. We then wrote our own inferring cards. Can you infer what is happening from what we have written? Watch our video and test your inferring skills! Can you infer what is happening in these paragraphs? Discuss some inferences you have made from the text you are currently reading. 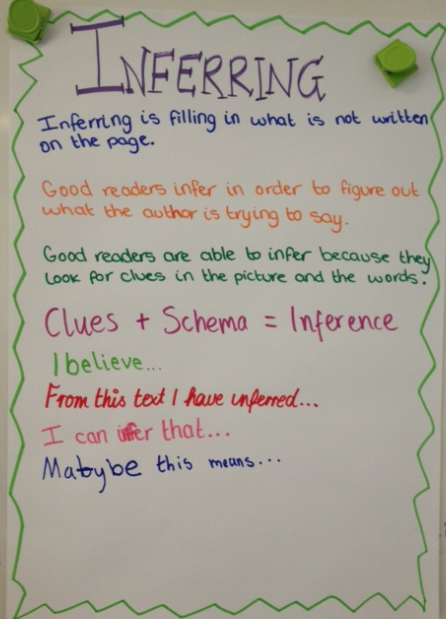 How has making these inferences improved your understanding of the text? In Grade 5/6 we are trying to be organised learners who manage our time wisely. We have learnt to identify areas of our learning we do well, as well as elements we need to improve on. This is something we will continue to work on for the rest of the year and will help us to become self managed, independent learners. But what is managing our learning all about? How do you manage your learning? What are some areas you will be focussing on this year? Why is managing your own learning important?